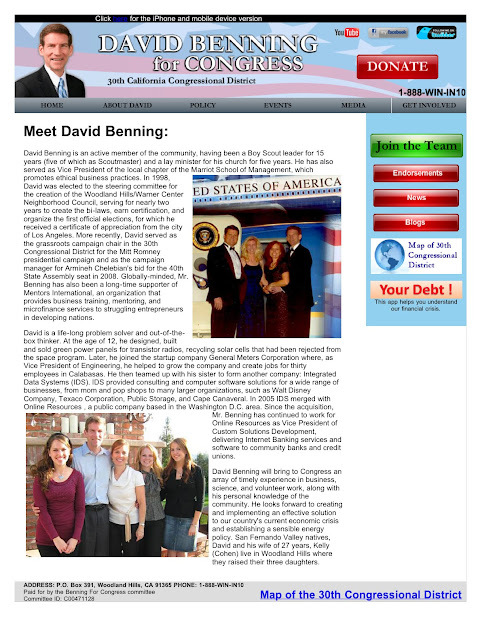 David Benning is running for Congress in California's 30th District (the Fighting 30th!). Benning's opponent is the incumbent Henry Waxman. It's going to be a tough race for the newcomer as Waxman is a fairly popular and powerful Representative. Benning has never held political office before. (Though his official website touts his 15 years of experience as a "Boy Scout leader.") And it seems that Benning was concerned that voters would be turned off by his lack of experience — so afraid, in fact, that he posted a photo of himself aboard Air Force One at the top of the "About David" section of his website. 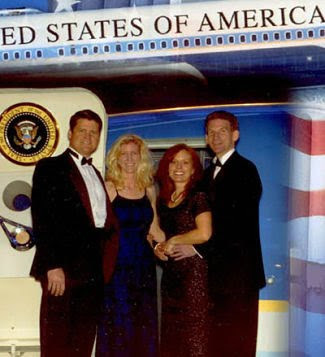 The photo depicts Benning, his wife and another couple in front of Air Force One's iconic door. You might ask yourself — what President invited Benning aboard a flight on the Presidential aircraft? The answer is "none." Turns out the photo is of SAM 27000, the decommissioned Air Force One that has been an attraction at the Reagan Presidential Library in Simi Valley since 2005. On his Welcome page, Benning says he's running for office because "It seems like Congress has completely lost touch with common sense." If that's the case, should Benning get elected, he'll fit right in. The aspiring Congressman did not have the common sense to identify the plane in his "About David" page as a phony. 1. Why post this photo at all? Take away the Air Force One backdrop, and it doesn't make much sense — there are two unidentified people in it. (I'm assuming the third unidentified person is his wife). Yet Benning chose the fake Air Force One picture to be the top photo on his "Meet David Benning" page — this is the photo that will introduce him to the voters of California. 2. He edited the photo before posting it. Looking at the original size of the photo (which can be seen on mine underneath), it's easy to see that Benning deliberately cropped the souvenir photo so as to make it look less like the gift-shop trinket it is. UPDATE: AS OF 2:20 PST, BENNING HAS QUIETLY ADDED A CAPTION TO THE PHOTO, IDENTIFYING THE AIRCRAFT IN HIS PHOTO AS BEING THE REAGAN LIBRARY PLANE. But I've archived Benning's page in its original form — you can view it HERE.